When St. Tammany does it part, the road from Chef Menteur to Slidell will unite this parish to the New Orleans to the Gulf Coast road, which will give us excellent connections with other points, and the building or the road to Hammond will still further give us good roads connection. Under the provision of the legislature automobile licenses will be turned into tho Stale road fund and will assist greatly in the construction of roads to which this parish will have access. 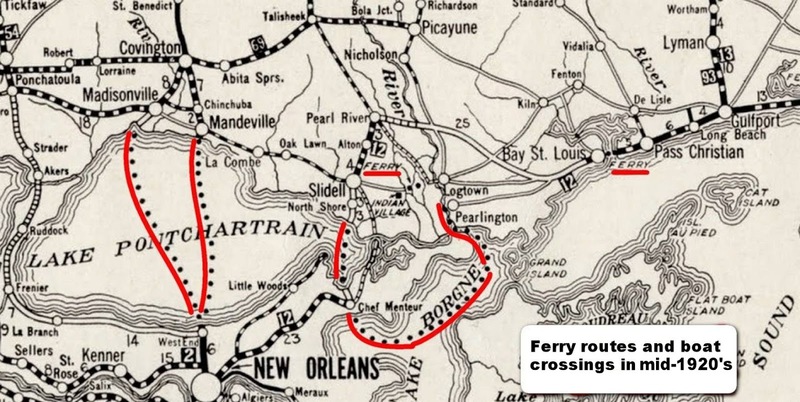 Survey of the road from the Rigolets to Slidell and from Slidell lo East Pearl River at a point in Mississippi between Napoleon and Logtown is already completed and an approximate cost furnished. 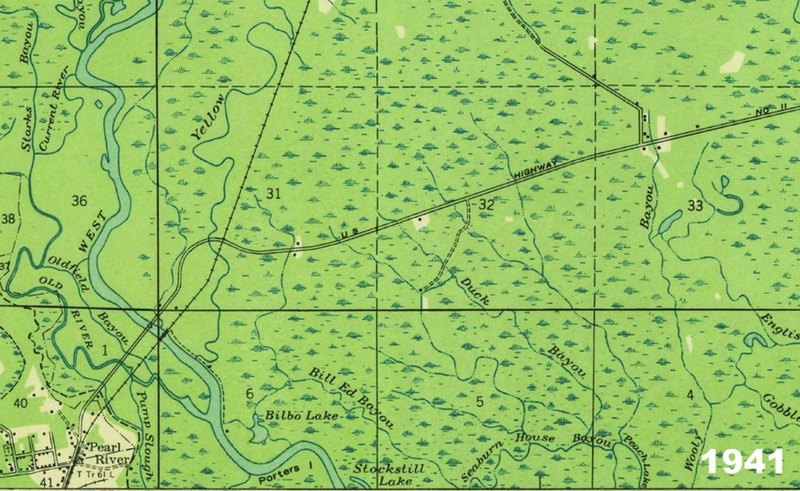 The distance from the Rigolets to Slidell is six and a quarter miles. 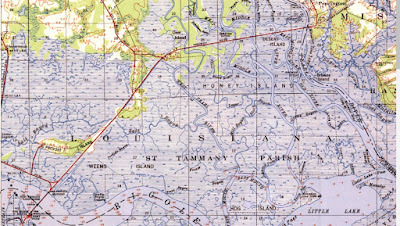 From Slidell to the Mississippi line is ten and a quarter miles. 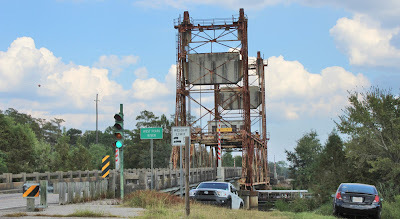 The work will be in charge of the State Highway De­partment and will be built with the funds provided by automobile licenses and lines and penalties collected in the parishes of Orleans, Jefferson, St. Charles, St. John the Baptist, Tangipahoa and St. Tammany. 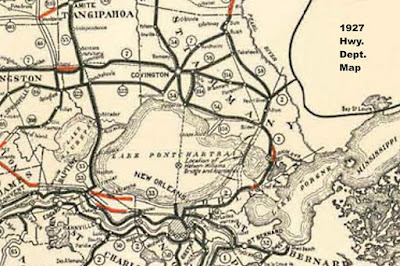 The cost of the road from the Rigolets lo Slidell, via the Mayfleld route, will be approximately seventy thousand dollars, and the road from Slidell to the Mississippi lino, including a draw bridge across West Pearl River and half the cost of a drawbridge across East Pearl River will be approximately $250,000. 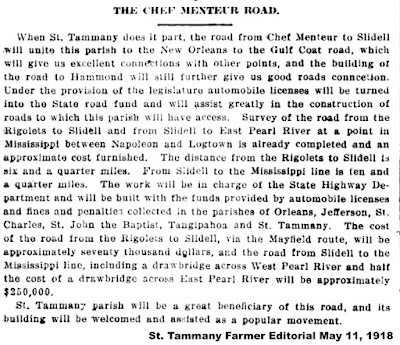 St. Tammany parish will be a great beneficiary of this road, and its building will be welcomed and as fated as a popular movement. After that segment was completed, motorists from New Orleans could reach St. Tammany but had to put their cars on ferry boats (represented by dotted lines on the map below) to cross the Chef Menteur Pass and the Rigolets. 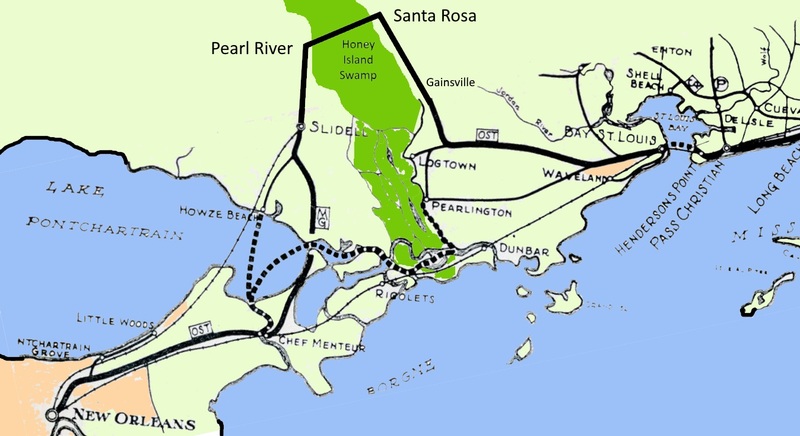 There was also a ferry (dotted line) that went from the Rigolets and up the Pearl River to Pearlington. 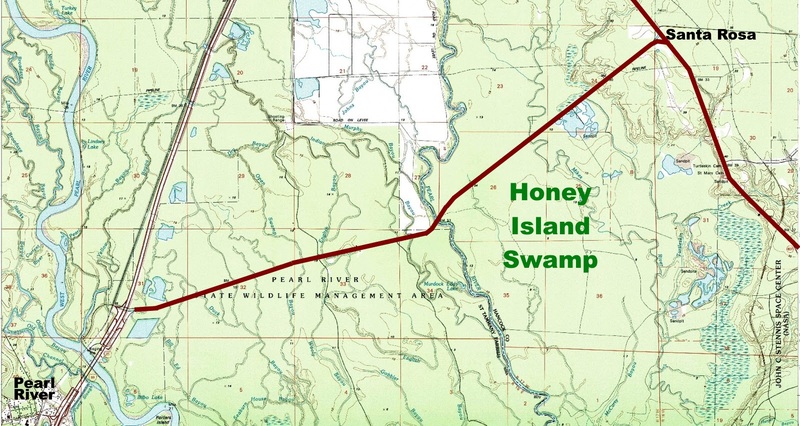 The project made additional progress when, in 1924, a portion of the road was built heading for the Gulf Coast from the town of Pearl River in St. Tammany Parish northeastward across the Honey Island swamp to the small Mississippi town of Santa Rosa. That was before there was U.S. Hwy. 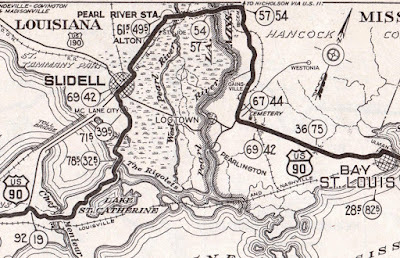 90 between Pearlington, Miss., and the Rigolets Pass. 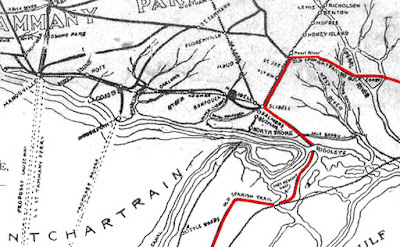 Click on the map below to see a larger version. 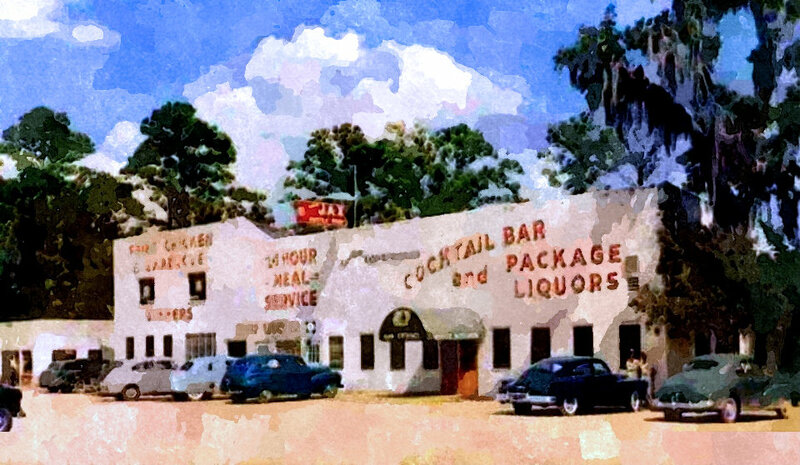 Louisiana Gateway to the Mississippi Gulf Coast. 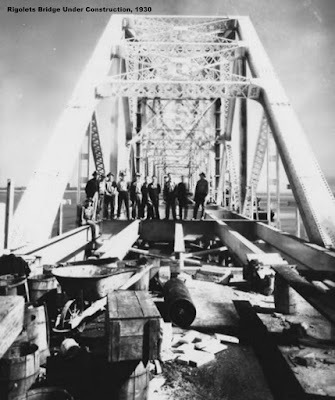 Bridge over the Pearl River leading into Mississippi, Year 1926. It opened for traffic in November of 1926. Image from the Bay St. Louis Facebook page. 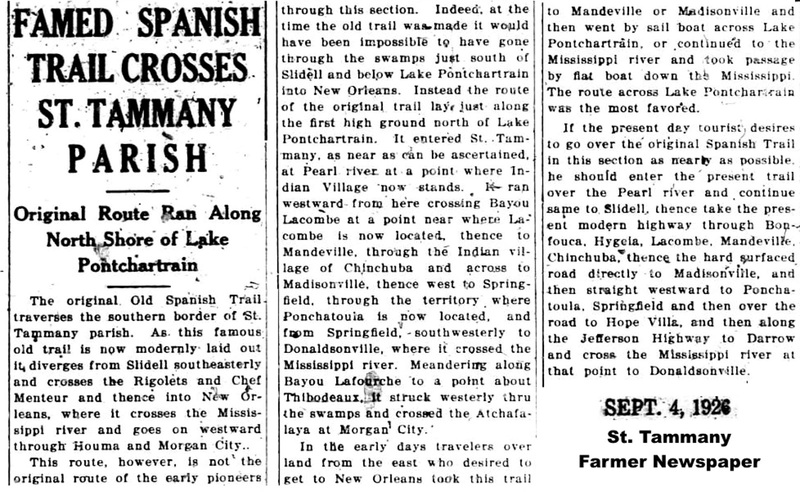 Thus, in the late 1920's, the only automobile route from Bay St. Louis, MS, to New Orleans was up to Santa Rosa, MS, then over the swamp to Pearl River, LA, then down through Slidell to the ferry at the Rigolets. 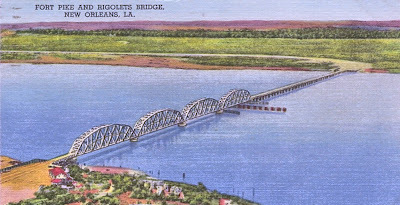 To get to New Orleans from there, cars had to board the ferry at the Rigolets Pass. A picture of that ferry is below. 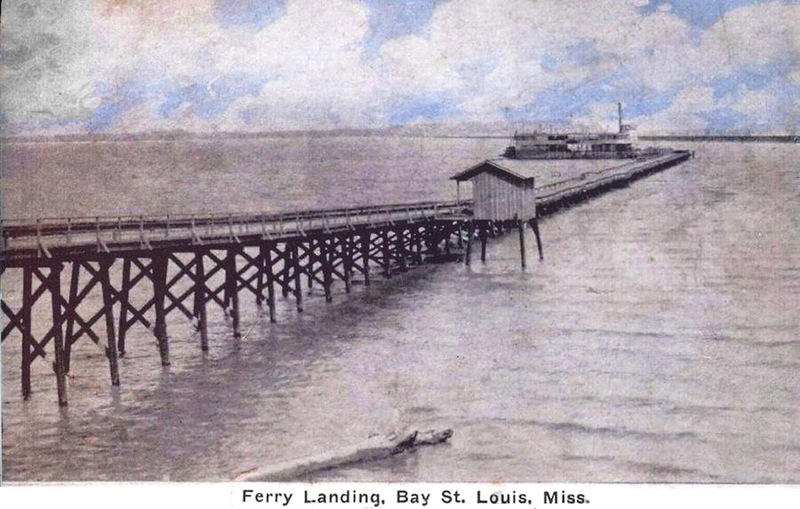 At Bay St. Louis, Miss., a bridge had not yet been built either, so another ferry carried people and cars across the Bay. 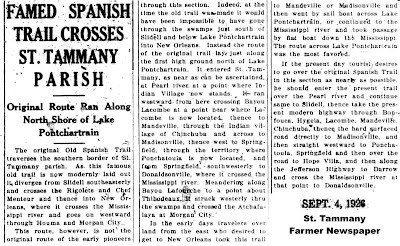 The new road built in 1924 between Pearl River, LA., and Santa Rosa, Miss., cut across the Pearl River Swamp at a point where some of the major creeks and streams were narrow enough to cross without building a major bridge. See below. 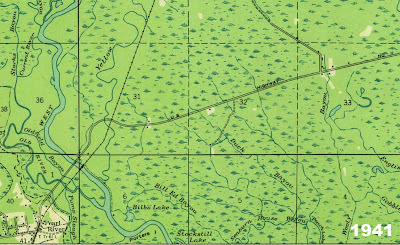 The topo map above shows the road built in 1924 heading northeastward out of Pearl River across the Pearl River swamp. 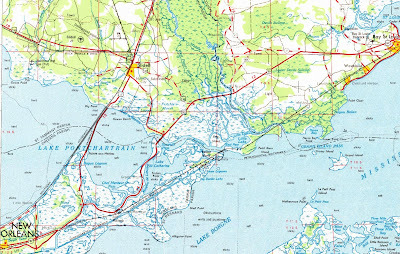 In the 1970's Interstate 59 was completed between Pearl River and Picayune, Miss., so U.S. Hwy 11 was re-routed to follow the Interstate 59 corridor. The bridges on the short cut to Santa Rosa were removed and now the old 1924 road is used to access the interior of the wildlife management area. 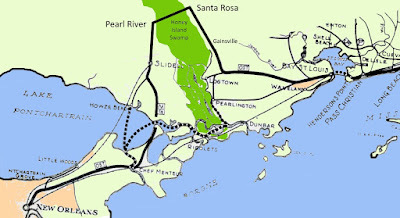 Between 1924 and 1934, the highway coming in from Mississippi and making the loop up to Santa Rosa and across to the town of Pearl River was called The Old Spanish Trail, a national highway from Florida to California. 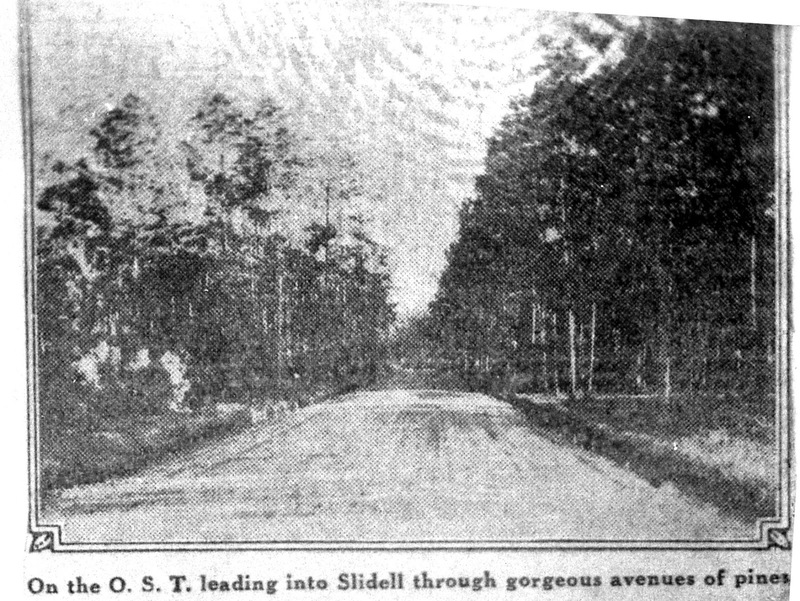 The part of the highway route that ran through Slidell is still called the Old Spanish Trail. 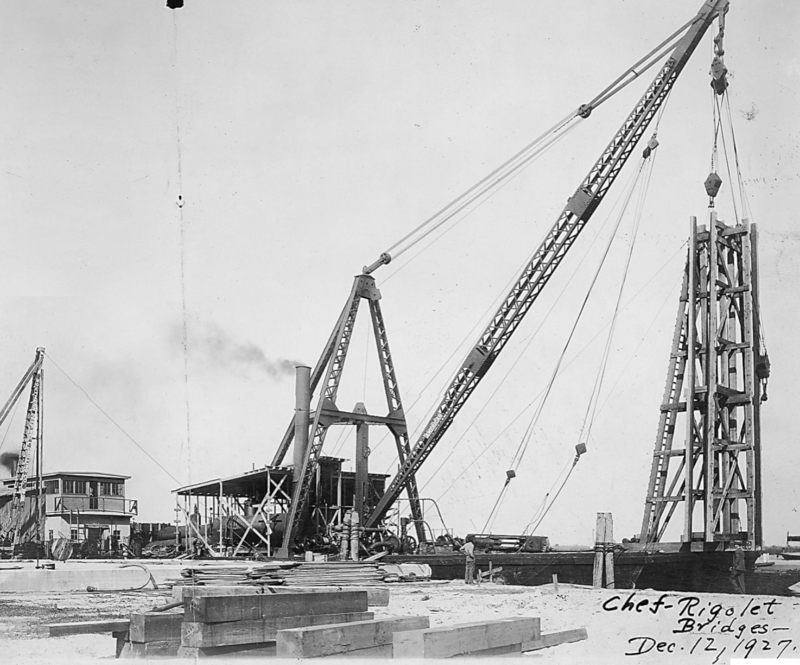 In 1928, a bridge was built over the Rigolets, eliminating the need for the ferry. It was opened to traffic on June 9, 1930. 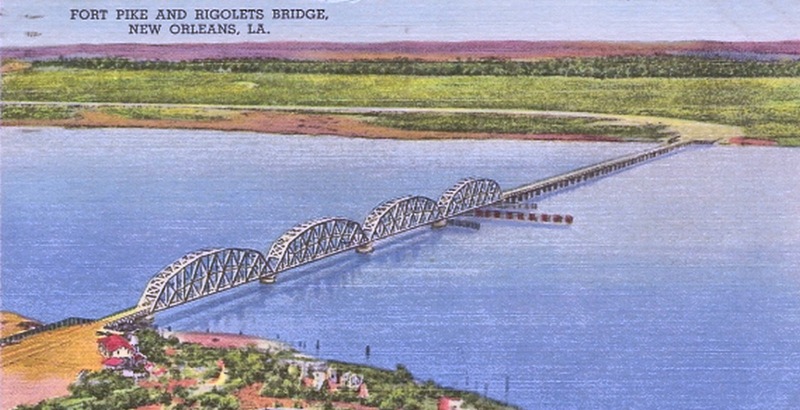 A postcard featuring the bridge over The Rigolets, southeast of Slidell. Fort Pike is in the lower part of the postcard, so the view is looking north. 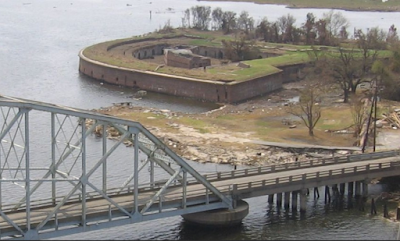 Notice that on the opposite shore there wasn't any road at this time heading off to the right towards Pearlington, MS.
On the southern end of the Rigolets Bridge was the historic landmark Fort Pike. 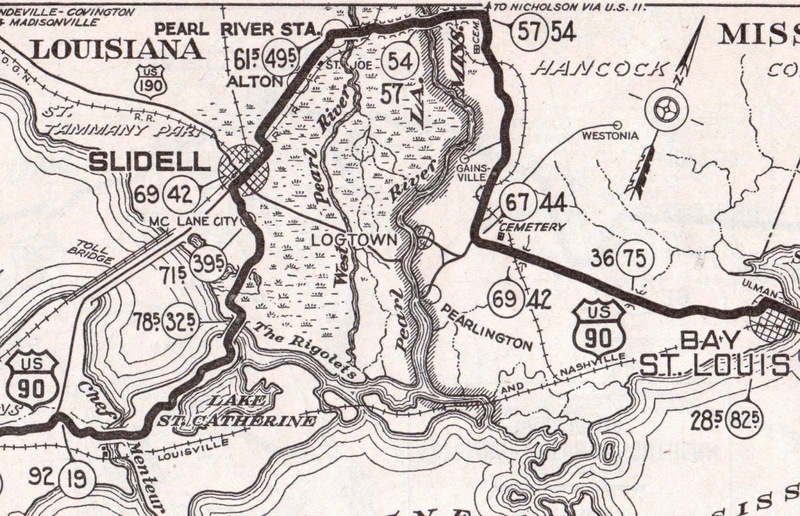 In 1933, a new shorter route was created when bridges were built over the East Pearl River, the Middle Pearl and the West Pearl River, and a highway (the future U.S. 90) was completed between Pearlington and the Rigolets. 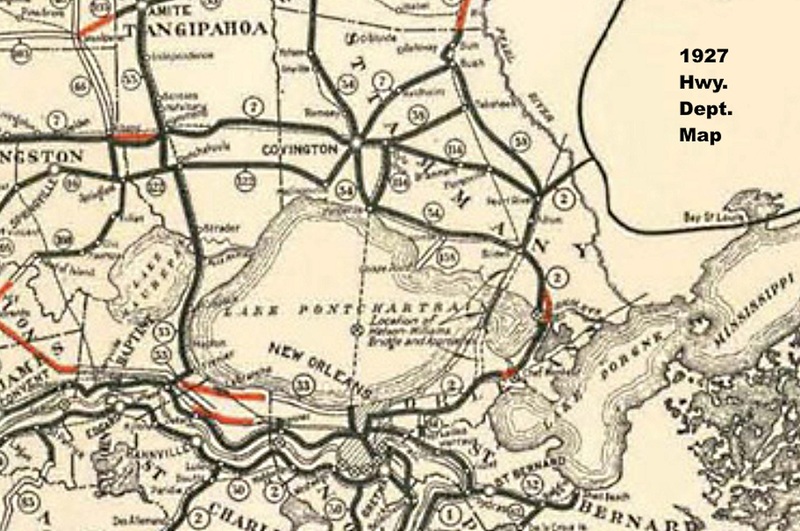 When that was finished, the connecting road between the Town of Pearl River and Santa Rosa was no longer the Gateway to Louisiana and thus some 22 miles were knocked off the journey to New Orleans. 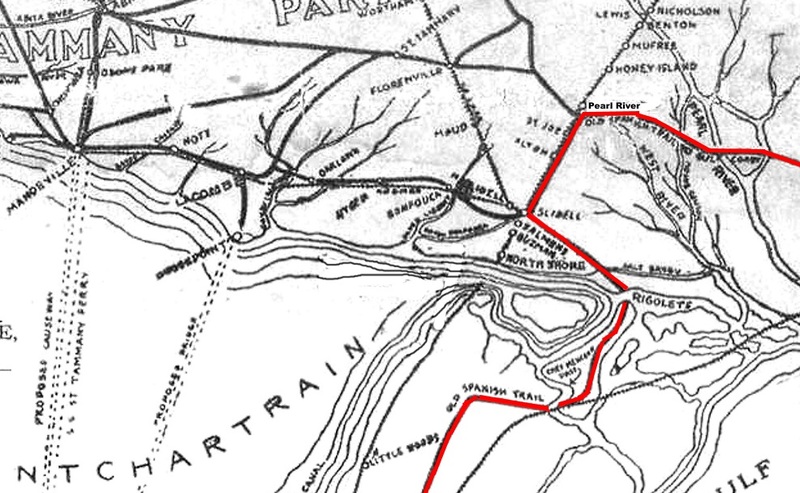 Shortly thereafter, the Old Spanish Trail route was re-aligned over to Hwy. 90 at Pearlington. These re-alignments often happened when a shorter, more convenient section of roadway became available. 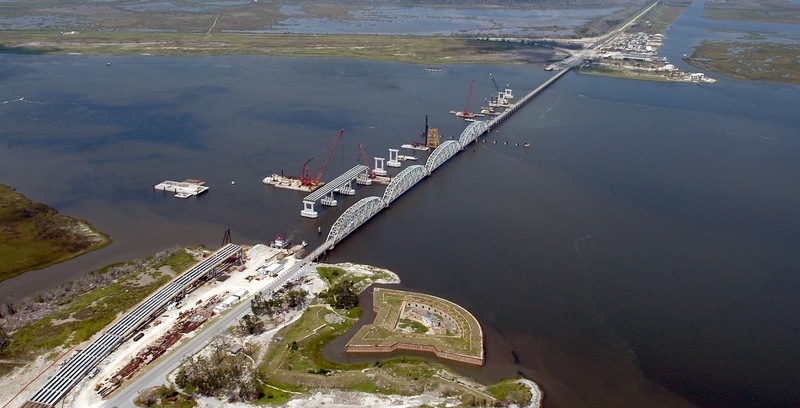 Below are current day photos of the bridges built over the West Pearl, Middle Pearl and East Pearl Rivers, which gave New Orleans traffic more direct access from Mississippi. It was recently reported that the State of Louisiana may be doing some major bridge improvements to the three bridges above in the next several years. When that eight and a half mile stretch of Hwy. 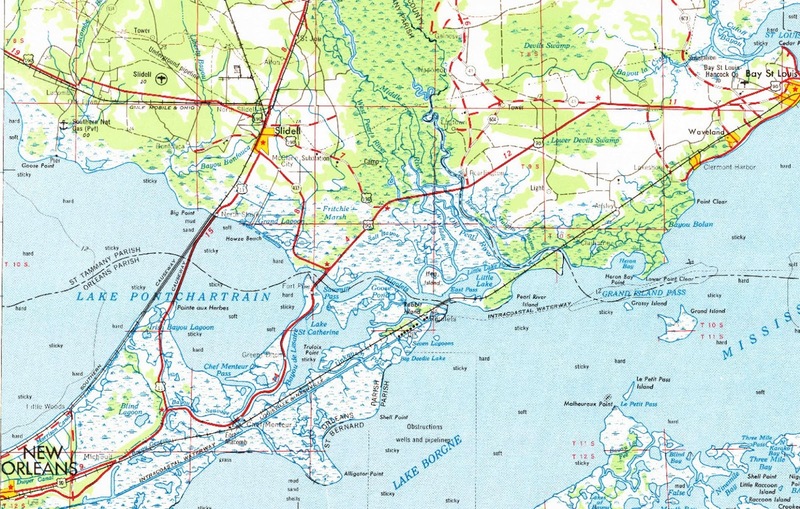 90 was opened between Pearlington and the Rigolets, it became the quickest and most direct route to the Mississippi Gulf Coast, meaning that a lot of people passed that way. So a restroom stop and a tourist attraction was bound to pop up. 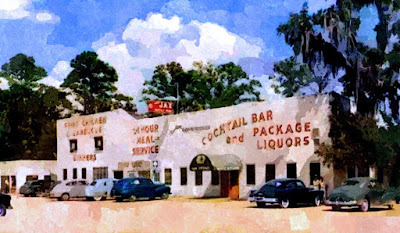 Everyone remembers the White Kitchen restaurant and Reptile Jungle tourist attraction on that segment of highway. Reptile Jungle in Slidell, Louisiana was owned and operated by the famous Arthur Jones who after opening Reptile Jungle, went on to became a millionaire when he invented the Nautilus physical fitness equipment system. The old Rigolets bridge was replaced in 2008 with a long sweeping high-elevation bridge. CLICK HERE for more information. Below is a picture of the new bridge. A YouTube video explaining the sequence. Click on the image above to start the video. 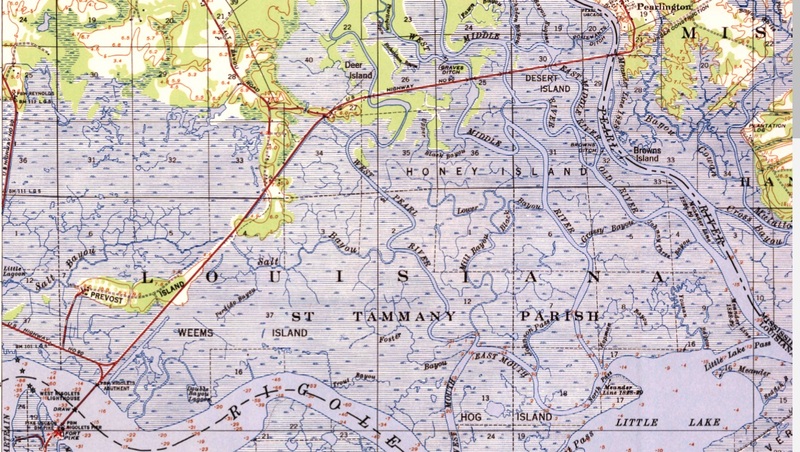 The roadway between Logtown and Gainesville was later absorbed into the Stennis Space Center buffer zone and residents in the area were moved to another location.